An incredibly brave and apparently prescient service dog in New York state took an instinctive leap in front of an oncoming school bus to prevent his owner from being hit. Never has “man’s best friend” resonated more than this story of Figo, a golden retriever guide dog, and his owner, Audrey Stone. When Figo the service dog saw an oncoming mini school bus heading for Audrey Stone, the blind woman he was trained to guide, the golden retriever’s protective instincts kicked in: He threw himself at the closest part of the vehicle he could. Police photos show the result: fur stuck to the front driver’s side wheel and in the middle of Michael Neuner Avenue in New York, where the bus came to a stop after striking the pair. The driver of the Brewster school bus, carrying two kindergartners to St. Lawrence O’Toole Childhood Learning Center, told police he didn’t see the pair crossing the road as they made their way home at about 8:15 Monday morning. Stone, 62, suffered a fractured right elbow, three broken ribs, a fractured ankle and a cut to her head in the accident, said Brewster Police Chief John Del Gardo. Figo’s leg was cut down to the bone, said Paul Schwartz, who manages the Xtra Mart gas station at the intersection and ran to the scene to help. But, if not for Figo’s incredibly commendable braveness, the consequences obviously could have been far worse. Schwartz and one of the EMTs bandaged Figo’s right leg. 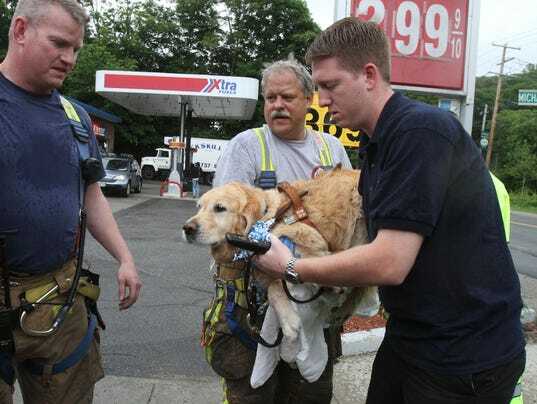 Because there are healthcare rules preventing animals from being transported in ambulances, Figo stayed behind at the scene. God Bless this dog’s loyalty. Figo and Audrey are set to reunite soon, thankfully. What a great pup you must be, Figo. We sincerely hope you and Audrey get well soon.